Have news or a tribute you'd like to see on the website? Send your news to let us know what you're up to. News and pictures are welcome. To submit photos, please email to alumnirecords@cornellphisig.org or mail to Alumni Records Office, Phi Sigma Kappa Fraternity, PO Box 876, Ithaca, NY 14851-0876. John S. Knight 1918: Publisher and owner, Knight Newspapers; member of Cornell Board of Trustees; Namesake of Knight Institute at Cornell. Cornell crew team, early '60s: Champion crew team. Most of the members featured on the June 18, 1962 cover of Sports Illustrated are Phi Sigs from Cornell. Will Gluck '93: Film director, screenwriter, and producer. Some of his films include Easy A (2010) and Friends with Benefits (2011). Zak Dentes '09: Record-setting Cornell sprint football captain and quarterback. On March 30, 2014, Marine Corps and Cornell top brass joined together to pay tribute to our Phi Sig brother Major Richard J. Gannon II '95. 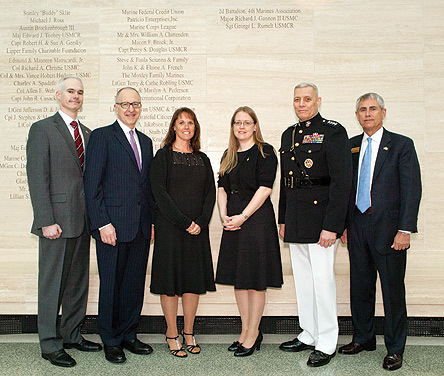 In a ceremony at the Marine Corps Heritage Museum, adjacent the Marine Corps base in Quantico, Virginia, an impressive group of speakers—Cornell President David J. Skorton, General John M. "Jay" Paxton Jr. (assistant commandant of the Marine Corps, Cornell class of '73), Lieutenant General Robert "Rusty" R. Blackman Jr. (currently president and CEO of the Marine Corps Heritage Foundation, Cornell class of '70), Phi Sig brother Brian Drumm '96, and Rick's wife, Sally Gannon—honored Rick's life, service, and heroism. For those not familiar, Rick, while serving with the Marines as a company commander, was killed in Iraq in 2004. Rick had served a combat tour in Iraq soon after the war began in 2003, and he had returned for a second combat tour in early 2004. On April 17, 2004, while relieving a besieged position in Anbar province, Rick went to the aid of a wounded fellow Marine and was killed in the ensuing firefight. For his actions, Rick was awarded the Silver Star. Rick was one of two Cornellians who have died in Iraq and Afghanistan in the service of our country. The event honoring Rick at the Marine Corps Heritage Museum was hosted by the museum in cooperation with the Cornell Club of Washington. The ceremony commemorated the dedication of Rick's name on the museum's Commandant Circle Wall. The ceremony was held in the grand atrium of the museum, beneath its 210-foot stainless-steel spire and glass ceiling, with several marine aircraft suspended overhead. About 150 people attended, mostly Cornellians and their guests. A large number of Phi Sig brothers and sisters attended, including Colonel Ron Obermeyer '60 (USAF), Major John Bradunas '77 (USMC), Mike Coe '85, Jim Richardson '87, Lisa Magid Richardson '87, Doug Ringel '88, Mike Rosenblatt '90, Colonel Ben Watson '91 (USMC), Barney Feingold '92, Lieutenant Commander Andy Fox '95 (USN), George Kontogiannis '95, Mike Wooden '95, Brian Drumm '96, Jennifer DeLong Harris '97 (USN), Lieutenant Commander Jon Frazier '97 (USN), Matt Roberts '98, Lieutenant Tom McGuire '06 (USN), Marc Yonkers '07, and Captain Zak Dentes '09 (USMC). The ceremony was part Marine Corps, part Cornell. President Skorton's participation demonstrated his and the university's respect for Rick and his service, and he spoke highly of Rick's dedication and achievements, including as a student before and during his time at Cornell. General Paxton, who first met Rick at Camp Pendleton in the late 1990s, described their connection as Cornell graduates and spoke proudly of Rick's Marine Corps leadership and service in Iraq. Brian Drumm shared who Rick was as a friend and Phi Sig brother. He humorously described their meeting as pledges. "Have you ever heard the expression 'insta-friend'? That moment when you meet someone and just immediately know you are going to be friends? For us, it was pretty much the exact opposite." Brian spoke of Rick's toughness, inflexibly conservative world view, passion for the films of Steven Seagal ("his earlier work, of course"), good humor (especially in poking fun at himself), and his love of "causing trouble in the fraternity house kitchen after a night in Collegetown." Mostly, though, Brian put into words the collective feeling in the room of sincere appreciation for Rick and his service. Rick and others who serve "give us the ability to not have to think about what they do," "to enjoy without question our safety and security," and, "even when horrible things happen, they permit us to put those things behind us and move on with our lives." That, Brian remarked, "is why days like today are so important," taking time for "remembering the people like Rick and the sacrifices they made to make our own wonderful lives possible." The attendees' gratitude for Rick's service was emotionally expressed with the spontaneous standing reception for Rick's wife, Sally, who had travelled from California for the event and graciously conveyed her appreciation to all involved. The speakers were followed by Cornell's alma mater, sung collectively by the crowd, plainly proud to have an association with Rick and the institutions with which he affiliated. 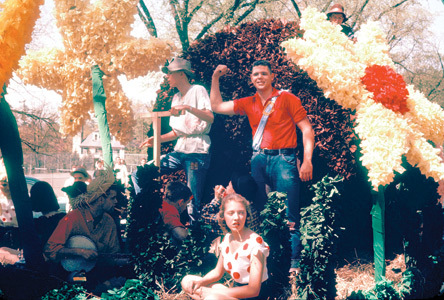 It was Spring Weekend 1958, and the brothers teamed with Delta Delta Delta sorority to enter a float in the float parade. I don't remember what the theme was, but we designed and built 'Lil Brown Jug, replete with 'Lil Abner (Jim Garrett '60), Daisy Mae (a Tri-Delt), a washpan bass player (Chuck Hill '59), a banjo player (Dave French '60) and assorted other hillbilly characters (Gerry Bernier '60). It was pulled by Zeke Scott's ('59) Model A Ford (see picture below, with Bill Tafuri '59 in the cab). The parade snaked through campus and through Collegetown without incident. It was a handsome float that drew a lot of applause from the students and town-folk lining the route. It was when the parade route turned on to State Street to head downtown that tranquility turned to potential disaster. 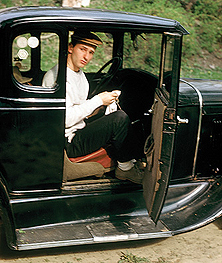 The Model A had mechanical brakes, which were not designed for steep hills like State Street, no less to hold a farm trailer loaded with hillbillies from cascading down the hill. About halfway down the hill, the driver let out a yell, "I'm losing my brakes!" Instant panic set in as visions of the Model A and float careening through the parade and spectators filled the driver's head. Then someone yelled, "Everyone off the float." All able-bodied persons, including some recruited from the spectators, put their backs to the Model A and the front of the float while others restrained it by hanging on to the rear. This provided enough "braking" to nurse our way to the bottom of State Street to the sound of supportive cheering and applause from the crowd. They all thought it was part of our "act"! We remained silent, got back on the float, and finished the parade. Disaster averted! We hope you enjoy the additional pictures from the 1950s. We have many more and will post groups of them on Facebook soon. My wife and I found Prudence Island, off Rhode Island, in 1979, and bought some land in 1980. Long before we had a house, we felt that we had found a home. It was clearly our reward for choosing New England. I was an inactive member of the Prudence Island Volunteer Fire Department for decades, pitching in here and there - rolling up hoses at a fire scene or chopping peppers for a barbecue. 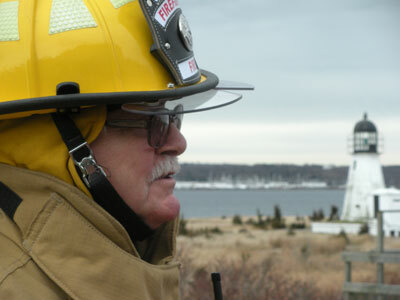 I was working as a cameraman at the time and helped out the NFPA (National Fire Prevention Assn.) on a few fire-prevention films about disasters. In a subsequent career in administration at Harvard, I started the first high-rise fire evacuation warden program, tailored to an academic building with no fixed population. After I retired from Harvard, I started going to the volunteer department's training drills and was soon recruited for the department's Board of Control. We have no usual fire hydrants, so moving water, by 2,000+ gallon loads is what we do. Some of those trainings are like day-long late-summer football practices. Shooting a hose with 180 psi water coming out of it is like having a blocking sled coming after you - for minutes on end. In addition to helping EMTs respond to medical emergencies at all hours and manning the fire station during hurricanes and winter storms, I have jumped out of bed to spend a long day working a house fire as a driver - pump operator. That's 10 hours or so of tending a constantly racing 2-cycle diesel. Though I'm sometimes doing work that most folks retire from when they're 10-15 years younger than I am, I find it challenging and rewarding. Our island is where the movie Moonrise Kingdom was set and it's worth the extra effort to be a part of island life. 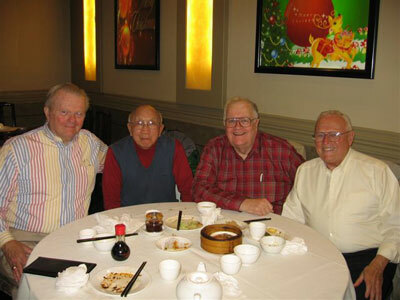 L to R: Paul Snare '56; Jack Peng, GA Tech; Ev McCooey '57; and Bob George '57.